*Dilly Dolls*: Twisted is backkkk! That's right dolls, its that time again. Sl's biggest and hardest hunt is BACK and once again Dilly Dolls is participating. Oriana has got a very special limited prize for you, if you can find it. (hunt starts 1st March 2011). The Freddi's Raven boots are texture/tint change and resizeable via click or HUD. 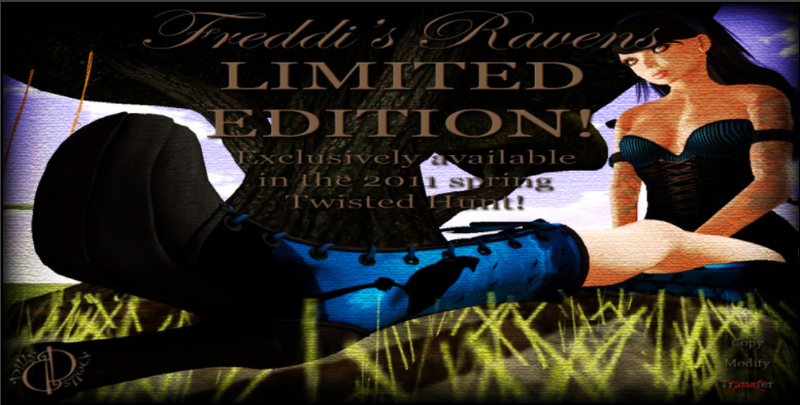 And they are strictly limited as a hunt gift for the FIRST WEEK OF TWISTED ONLY!!! Then the gift will be switched out, so if you like them, and seriously, whats not to like, you need to come and hunt for them the first week of Twisted.